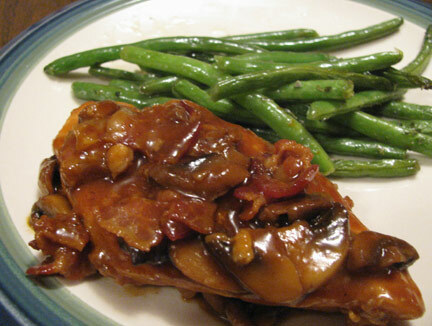 Yeah, I know there are a lot of opinions on what makes the best Chicken Marsala, but I'll just say one word...mine! Brine the chicken breasts first: 3 T salt in 1 1/2 quarts of water for 1 hour in the fridge. Place oven rack in lower middle, and preheat to 300. Drain, rinse, and dry the chicken. Place the flour in a plastic bag and coat the breasts one at a time. Heat some oil in a Dutch oven and brown the breasts on both sides over medium high heat. Use a tiny bit of Marsala to loosen the fond. Cover the pot with both foil and the lid, and braise at 300 for 1 1/2 hours. About 15 minutes before serving, heat a large non-stick skillet and cook the pancetta. Remove to drain and pour off any excessive oil. Saute the mushrooms for about 8 minutes, until released juices evaporate. Add garlic, tomato paste, and cooked pancetta. Heat and stir for a minute. Add the Marsala and raise the heat to simmer vigorously, scraping up browned bits. Cook for about 5 minutes until sauce thickens slightly. Off heat, add lemon juice, the juices from the chicken, and the butter. Whisk in the butter until smooth. Pour the sauce over the chicken and serve immediately. Garnish if desired.